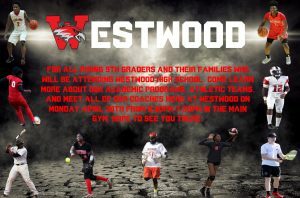 Westwood High School’s Athletic/Academic Info Night is for all rising 9th graders and their families who will be attending Westwood High School during the 2018-19 school year. Come learn more about our Academic Programs, Athletic Teams, and meet all of our coaches here at Westwood on Monday April 30th from 6:30pm-7:30pm in the main gym. Hope to see you there!